Each New Year, China’s railway stations become teeming, seething compounds of thousands of commuters. Here, they queue for tickets at booths where demand far outstrips supply, or wait in the forlorn hope that the train will turn up on time – if at all. This anxious group are all aching to return to their villages to see the families they left behind as they sought employment in the cities. Last Train Home focuses on one family caught up in this desperate situation. In the ‘90s, the Zhang family were forced to leave their young children with their grandparents as they left to find work. Eager to improve the prospects of their children, they work hard and live simple lives, sending as much money as possible to the family they left in their rural village. This cash, they hope, will provide the education they were denied in their own youth. Sadly, their daughter cannot see beyond her perceived abandonment and rebels. Dropping out of school, she decides to earn her own money by becoming a migrant worker, too. It’s a huge blow to her family, and Last Train Home concerns itself with the Zhangs’ attempts to heal the family rifts, and guide their daughter back onto the path they chose for her. Opening with scenes of workers sewing garments in a crowded factory, we are instantly introduced into the drudgery of life in the Guangzhou. Here, staff work in open-plan conditions producing clothing for the West. It seems that all aspects of life take place within the grey walls of the factory – food is eaten communally and bedrooms are little more than stalls. A montage of images quickly conveys the grimness, which is in direct contrast to the lush greenery of the life Changhua and Suqin left behind in Sichuan province. In the country, their children, Qin and Yang, live on the family farm with their loving grandmother. They gather corn, eat as a family, and their life seems much happier than that of their parents. Beautifully framed shots of paddy fields with farmers slowly meandering across the screen confirm that the pace of life here is much more sedate. Following their first arduous journey across the country, Changhua and Suqin are reunited with their children. The expectation is of a joyous coming together, but instead there is a sullen air about the kids. It quickly becomes apparent that gifts of mobile phones don’t cut the mustard, especially with their daughter, Qin. She’s resentful of an approach to parenting which casts her mother and father in the role of providers of money – but not love. The relationship between the daughter and her parents deteriorates from this point on. Never judgemental, the film allows each character to get their point across, and it’s perfectly possible to sympathise with all parties. 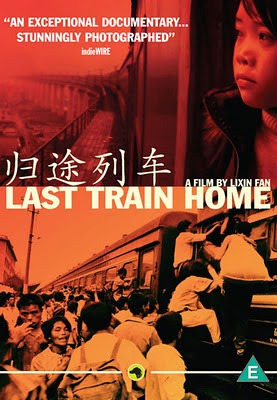 One scene in particular illustrates the strange dynamic between the three characters: waiting for a train to take them back to Sichuan, they encounter a heaving station caused by a power cut further up the tracks. In the midst of the crowded chaos, the characters bicker – Qin sniggers at her mother and Changhua attempts (not particularly effectively) to take control of the situation. It sums up the dynamics of their relationship perfectly – all the more dramatic for being set amidst the human debris and emotion of the angry mob. Lixin Fan’s directorial approach is to offer as little interference as possible in proceedings – and this has really paid dividends. The access he has gained is incredibly personal, and grows more so as the film progresses – it’s clear that the relationship he has built with the family has grown stronger and more trusting over the three year period in which filming took place. This can be seen most clearly in Changhua – initially he is meek, mild and ineffectual. He seems wary of the camera and is usually in the shadow of his more vocal wife. Even during direct addresses to the camera, he is often almost eerily quiet – a man of few words. Yet the most explosive scene of documentary takes place when Qin swears in front of him. He explodes in a violent rage – the first time his self-control has been lost. It’s indicative of the tension which has been boiling within him, but also points to a comfort with the camera which was evidently missing earlier in the piece. Last Train Home is sedately paced, yet utterly engaging. The neutrality adopted by the director ensures that a complicated situation is allowed to breathe on screen, and this allows the audience to decide where their sympathies lie – if anywhere. It’s a documentary which asks many questions about the role of parents, the way capitalism is impacting on China and the merits of self-sacrifice. Thankfully, Lixin Fan is not patronising enough to try and answer those questions himself.